If you’ve been following me for a while, you probably know how can be Instagram effective marketing channel. If you’re here for the first time, I’d recommend reading the first part of this series – How to get 100 Instagram Followers in 24 hours and the second part, How we’ve grown to 52,129 Instagram followers in less than 8 months. A few months ago, WeekHack had 1,000 Instagram followers. In less than 8 months, we’ve grown to 54,000 followers. Whether you’re looking for a way to grow your audience, engage with your audience or get traffic to your product, service, or affiliate offer, Instagram is one of the best places to go. But growing our page and engaging with my followers would be impossible without automation. I can’t imagine doing it manually. Do you want to manage your Instagram account more efficiently? Wondering which Instagram tools and apps will help you to stand out and be more effective? Let’s start with Instagram scheduling tools. Free Class: Instagram Audience from Scratch – Attract quality followers, increase engagement & make more sales on Instagram! 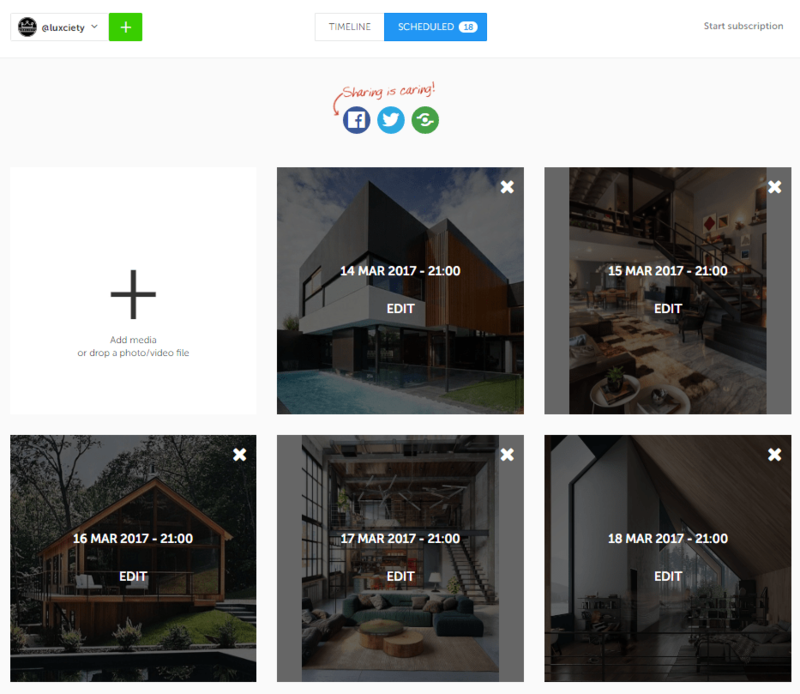 Social Captain – This tool allows you to schedule unlimited photos/images on Instagram in advance without using your smartphone. If you need to automate your captions, liking, commenting, updating your bio, Blitzsagram will help you with that as well. I’ve been using Blitzsagram personally from the day it was released. Grum – One of the biggest frustrations for Instagram users is not being able to schedule their posts in advance like on other Social Media sites like Facebook, Twitter or Pinterest. That means many people believe that the only way to post an image on Instagram is through their Smartphone. 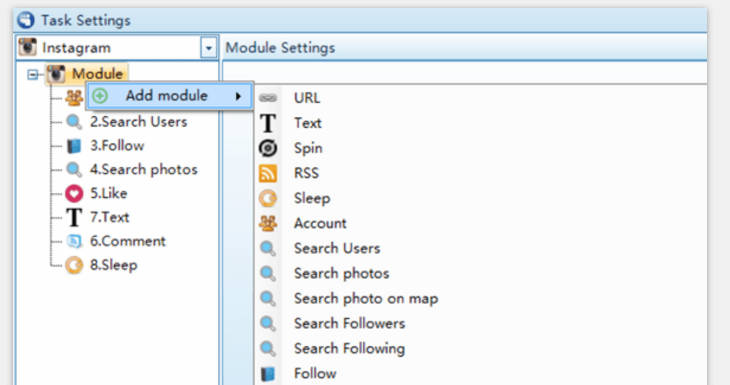 Grum is very popular and one of the few tools that enable you to schedule unlimited posts automatically from your desktop PC. Repost – Creating content for your Instagram and Social Media account can be extremely time-consuming and I’m sure you don’t want to find free time in your busy schedule all the time. Once this situation happens, Repost is definitely going to be your best friend. Repost app enables reposting other’s people stuff with a single click… And the best part? It will give them credit as well. Bookmark favorite photos and save them for later use. One tap repost – Repost and credit the author with a single click. Let’s continue with special tools build for the purposes of growing audience, engaging with your followers and building a relationship with them. Hashtagify.me – This website allows you to expand on hashtags. What do I mean? You simply type in your main hashtag and the website will magically find similar hashtags that you would have never thought of. This helps you reach a broader range of followers because you are tapping into a new search result found inside of the Instagram platform. Do you want to send a welcome direct message to your followers? With FollowingLike it’s really easy. This tool allows you to do all the mentioned tasks in three different speeds. If your account is a few days old – you don’t want to follow hundreds of people right of the bat. So you should initially start with slow speed, after a few days or weeks, move to medium, and eventually to high. Send automated direct messages to your followers. SocialBlade – This website allows you to see who buys followers. Why is this so important? Because if you’re buying shoutouts from Instagram pages who have fake followers you’re wasting your money. Visualize daily gained & lost followers. It works for Instagram, Twitter, Youtube and more. Iconosquare – Are you serious about building an online presence and growing your Instagram account? If so, one of the most important things is to analyze every step on your way. If you don’t measure the result, you can’t improve. Quite obvious, right? Iconosquare is probably the most advanced analytics tool for Instagram. Discover the location of your followers. Visualize how your posts are performing in real–time and compare with previous ones. Measure the number of likes and comments received. Find out your most engaging pictures. Discover the best time to post to get your post seen by most people. Track up to 7 of your competitors. Instagram Business Account – You’re right, this is not a tool. This is a feature from Instagram. If you do not want to pay for analytics like Iconosquare, you can (and should) set up a business account. 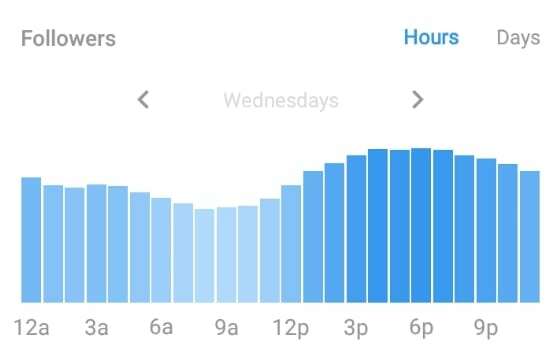 Now, if you switched to the business account, you can see how much impressions your post received during the last seven days. How many people visited your website through Instagram, the demography of your followers and a few other things. It allows you to see when your followers are online. Detailed demography of your followers. Statistics about your images (impressions). Onlypult – Being up to date with your marketing efforts is critical. Marketing trends are changing almost as often as our jeans. We should take a look at what our competitors do regularly. 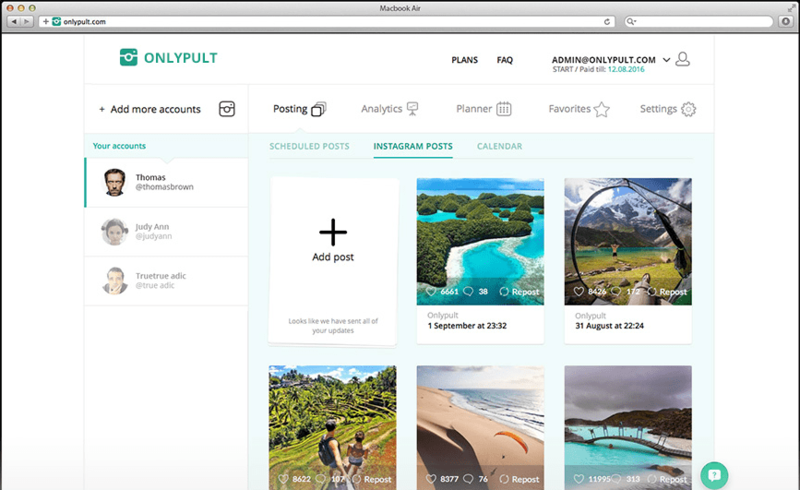 Onlypult allows you to sneak out on your competitors and see how their posts performed. Social Rank – Not all your followers are equal. Some of them give you follow and never come back to you, some of them engage with you every once in a while and some of them become lifers (people who love your content, love what you do, and engage with almost every content you post). Secondly, you want to connect with influencers who can help you get more exposure. 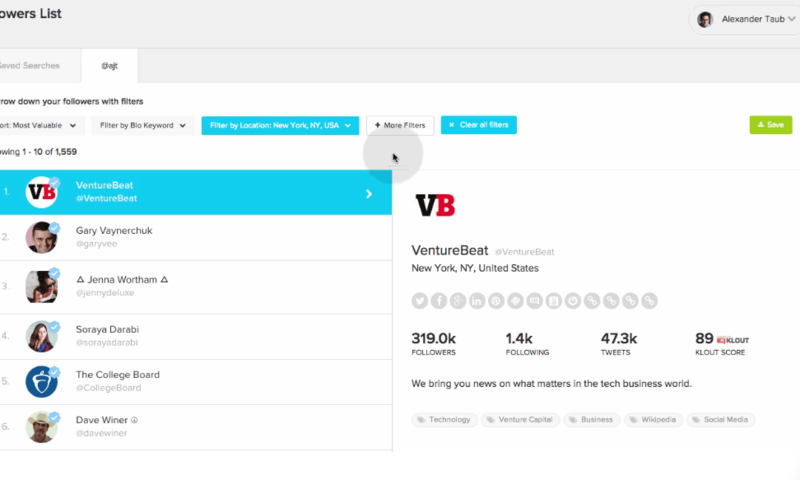 Social Rank helps you identify the most valuable followers, brand advocates, and influencers. Obviously, it is important to build a relationship primarily with those people. They’re more likely to become your visitors and customers. As it turns out, I couldn’t be more wrong. Thanks to the tools mentioned below, it takes only a few minutes to create beautiful pictures for your profile. WordSwag – App for iPhone and Android. Very easy to use, a lot of high-quality backgrounds, sayings, and stock photos. This app even offers a lot of quotes you can use right off the bat if you don’t have inspiration for your own. Instaquote – With Instaquote, you can choose from 50 different fonts, choose a background from high-quality collections, and customize your words (font size, color, position & line spacing). Canva – Canva is a free design tool aimed at beginners and professionals who don’t want to spend a lot of time on Social Media design. 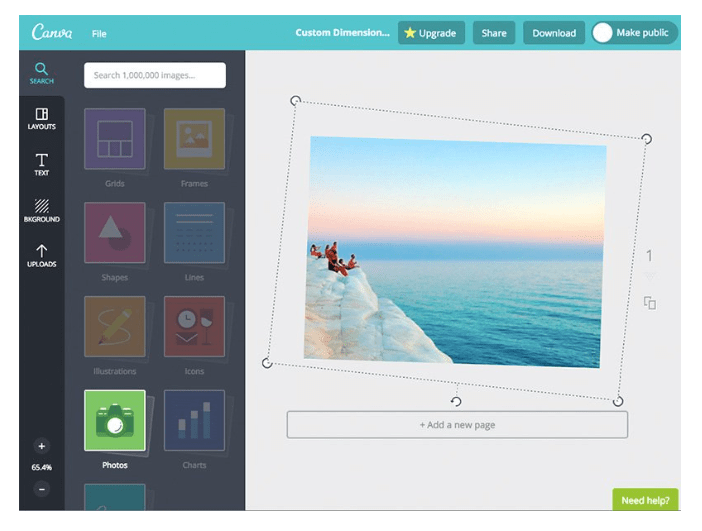 It’s a web-based app, and you can create images for all Social Media sites. 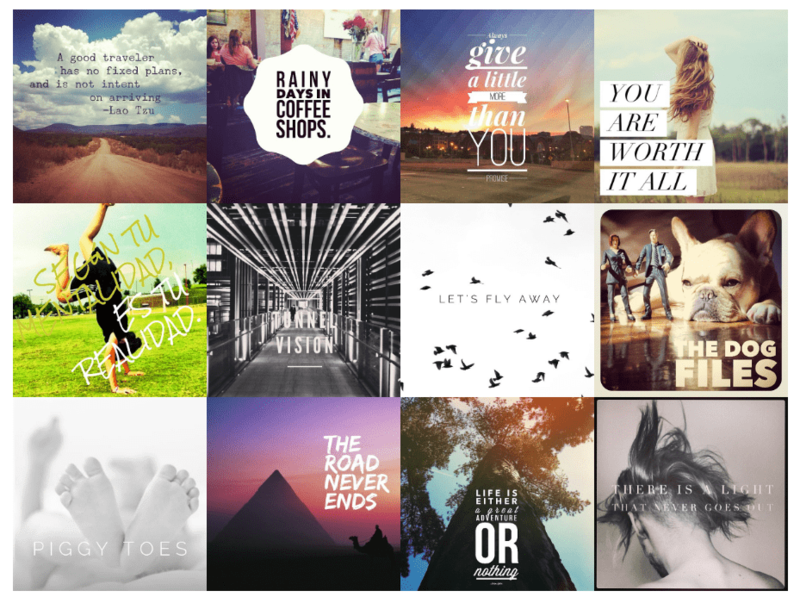 Recite this – Offers professionally looking templates for your Social Media Graphics. Enter your quote, select a template, and you’re done. Instagram can be a huge asset in building an online audience, connecting with your ideal followers and building an email list. But, without the right tools, it can be very frustrating and time-consuming. And, as you know, the purpose of starting an online business isn’t to spend all day on Social Media. These Instagram tools will help you schedule your images in advance, grow your audience, engage with them, help you to understand what their needs are and enable you to automate your Instagram marketing 24/7. Thank you! Wish to try some of them asap! Very actionable tips. Thank you for this article. We are going to try this ASAP. Do you drive traffic from Instagram? I can understand that you need to be in IG if you’re a brand, but not otherwise. I was only aware of Repost but glad to find some more useful tools to handle IG. ? Thanks Jan, very helpful. I am going to check out that Iconosqare thing, sounds pretty useful. I use Onlypult for over 5 months now and am very happy. I don’t know if there is a better tool for me and what i would do without it with my almost 40 clients accounts. I can also have managers helping me out, without giving them the passwords from the Instagram accounts, which is pretty priceless. So yeah, very happy. Thanks Jan for another great article, its extremely useful! Hey Danny, thanks for your kind words! Messages like this one motivate me to produce more and more content. These are great tools and I’m definitely trying the others! I also recommend Phlanx’s Collaboration Portal – you can find a lot of opportunities listed by business owners – small and big brands. Bloggers are also posting on that site to find collaborations. I use this free tool to find bloggers I can collaborate with – to help promote my products and boost my engagement rate and sales. Hope you can check it out. Cheers! Thanks for the note, Tiffany. Sounds like a great tool for me as a blogger. Snoopreport https://snoopreport.com. It tracks the actions of Instagram users as likes, comments and follows so you can monitor competitors, customers, influencers, research user insights and update a marketing strategy. Sounds great, Troy! Thanks for mentioning this tool, I’ll definitely take a look.